The Inventory tab will outline some at-a-glance inventory metrics for a given time range, such as the value of goods on hand the cost of goods sold. Filters: This allows you to filter what items are shown by sales channel. 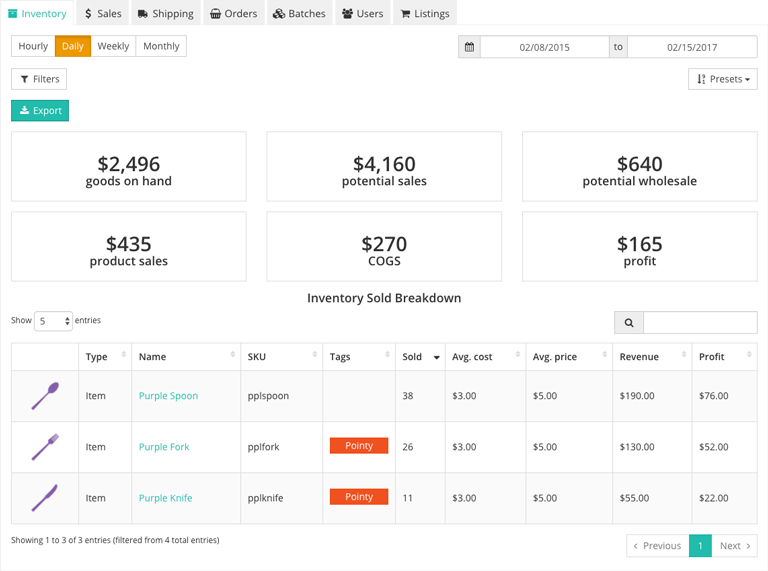 Export: This tool will quickly export your inventory metrics to a CSV spreadsheet. This is handy for use in various accounting tools. Search: This allows you to search for items by their name or SKU. Goods on hand: The total value of your inventory by each items or kits' listed wholesale cost. Potential sales: The total value of your inventory by each items or kits' listed retail price. Potential wholesale: The total value of your inventory by each items or kits' listed wholesale price. Product sales: The total sales amount in orders fulfilled within the selected date range. COGS (Cost of Goods Sold): The total cost of the items or kits fulfilled within the selected date range. Profit: The total sales amount netted after the total wholesale cost within the selected date range. Type: This indicates whether the product is an item or a kit. Name: The name that was entered when creating the item or kit. Select an item or kit's name to open its details page, where you can manage the listings that it's connected to. SKU: The unique identifier that is tied to the item or kit. You can edit an item or kit's SKU by clicking the item or kit's name and editing the details on the page that appears. Tags: The tags (if any) associated with this item or kit. Tags can be modified in the Inventory section under the Items or Kits page. Sold: This count represents the total quantity of this item or kit that has been fulfilled within the selected date range. Avg. Cost: This count represents the average wholesale cost that was submitted in purchase orders within the selected date range. Avg. Price: This count represents the average sales price in orders fulfilled within the selected date range. Revenue: This count represents the total sales amount in orders fulfilled within the selected date range. Profit: This count represents the total sales amount netted after the total wholesale cost within the selected date range.